On December 25, 2004, a boy was born to a nomadic farmer family in the small village of Phera in the Solukumbu district of Nepal. He was to be recognized by His Holiness the Dalai Lama as the reincarnation of Venerable Geshe Lobsang Jamyang who died in a tragic accident in Taiwan in February 2004 [Mandala June-July 2004]. Geshe Lobsang Jamyang was born in 1966 in the small village of Ale in the Solukumbo area. Around 1979, he entered Kopan Monastery. In 1984, he joined the great Monastic University of Sera Je where he enrolled in Tsawa Khangtsen [house section]. He completed his studies of the five major Buddhist philosophical texts and was awarded the privileged title of Geshe Lharampa. Subsequently, he joined Gyumey Tantric College to pursue the study and practice of Vajarayana, successfully completing this extensive course. … Eventually, as instructed by Lama Zopa Rinpoche, Geshe Lobsang Jamyang went to Taiwan and became the resident teacher at FPMT’s Heruka center. There, he worked hard in the service of Buddha’s teachings, and in particular the flourishing of the teachings of Manjushri Lama Tsongkhapa. He helped numerous disciples with his skilful and compassionate guidance by teaching what was most effective and suitable for them. On February 24, 2004, Geshe-la passed away. He was reborn on December 25, 2004 as a boy named Pempa Gyalpo by Sonam, a local lama. “Pempa” being the Tibetan word for Saturday, the day he was born. 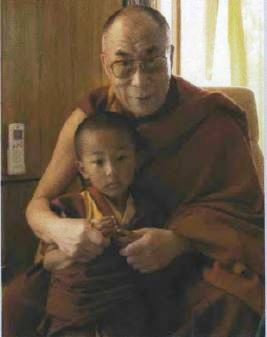 When he was around eight months old he became and was taken to see His Eminence Trulshig Rinpoche for consultation. He was given the new name of Karma Tsering. When he was around two years of age, he would talk about the monastery he had lived in where he had many disciples, but his family paid no attention to these special indications. Yet from a young age he was quite different from other children. His play was always spiritually related, such as playing the damaru or making ritual cakes. Also, he enjoyed being alone.